An inspiring idea to start with in the new year: collect a sunset every day, always using the same viewpoint. 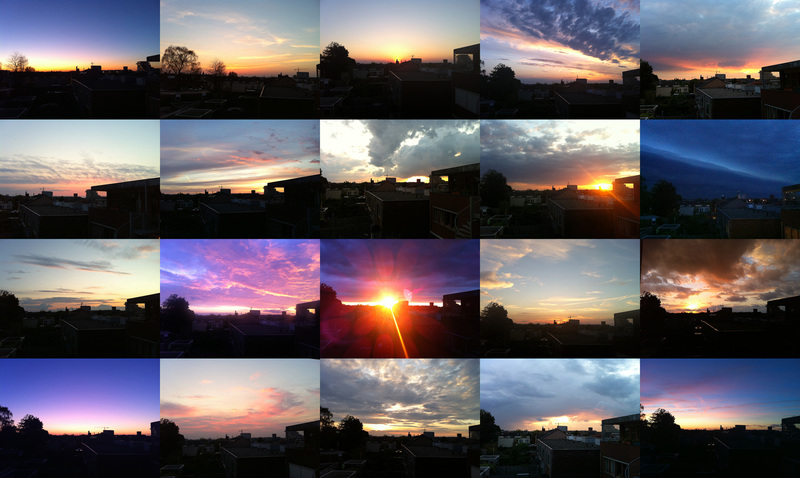 I made the sunset collage you see below already in 2012. Sunset photography doesn’t have to be difficult, when high resolutions and realistic colors aren’t the most important things. I made my photo’s simply with my iPhone, using the Camera + photo app with additional filters. At the end of 2012, I selected the different colors, cloud patterns and weather types I liked the most. After that, I simply made the collage using Photoshop. Do you see the little storm on the right side which blocked my sunset one day? Das inspiriert mich gerade für meine eigenen Fotoprojekte. Habe ein Projekt Himmel fotografiert mit verrückten Wolkenformationen. Danke für neue Ideen!